Writing is fifty years behind painting. I propose to apply the painters' techniques to writing; things as simple and immediate as collage or montage. Cut right through the pages of any book or newsprint... lengthwise, for example, and shuffle the columns of text. Put them together at hazard and read the newly constituted message. Do it for yourself. Use any system which suggests itself to you. Take your own words or the words said to be "the very own words" of anyone else living or dead. You'll soon see that words don't belong to anyone. Words have a vitality of their own and you or anybody else can make them gush into action. The permutated poems set the words spinning off on their own; echoing out as the words of a potent phrase are permutated into an expanding ripple of meanings which they did not seem to be capable of when they were struck into that phrase. The poets are supposed to liberate the words - not to chain them in phrases. Who told poets they were supposed to think? Poets are meant to sing and to make words sing. Poets have no words "of their own." Writers don't own their words. Since when do words belong to anybody. "Your very own words," indeed! And who are you? At a surrealist rally in the 1920s Tristan Tzara the man from nowhere proposed to create a poem on the spot by pulling words out of a hat. A riot ensued and wrecked the theater. Andr� Breton expelled Tristan Tzara from the movement and grounded the cut-ups on the Freudian couch. In the summer of 1959 Brion Gysin painter and writer cut newspaper articles into sections and rearranged the sections at random. "Minutes to Go" resulted from this initial cut-up experiment. "Minutes to Go" contains unedited unchanged cut-ups emerging as quite coherent and meaningful prose. The cut-up method brings to writers the collage, which has been used by painters for fifty years. And used by the moving and still camera. In fact all street shots from movie or still cameras are by the unpredictable factors of passersby and juxtaposition cut-ups. And photographers will tell you that often their best shots are accidents . . . writers will tell you the same. The best writings seems to be done almost by accident but writers until the cut-up method was made explicit-all writing is in fact cut-ups; I will return to this point-had no way to produce the accident of spontaneity. You cannot will spontaneity. But you can introduce the unpredictable spontaneous factor with a pair of scissors. The method is simple. Here is one way to do it. Take a page. Like this page. Now cut down the middle. You have four sections: 1 2 3 4 . . . one two three four. Now rearrange the sections placing section four with section one and section two with section three. And you have a new page. Sometimes it says much the same thing. Sometimes something quite different-cutting up political speeches is an interesting exercise-in any case you will find that it says something and something quite definite. Take any poet or writer you fancy. 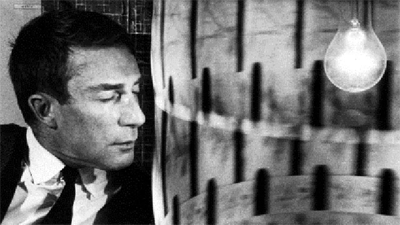 Brion Gysin (1916�1986) was a visual artist, historian, novelist, and an experimental poet credited with the discovery of the �cut-up� technique -- a collage of texts, not pictures -- which his longtime collaborator William S. Burroughs put to more extensive use. He is also considered one of the early innovators of sound poetry, which he defines as �getting poetry back off the page and into performance.� Back in No Time gathers materials from the entire Gysin oeuvre: scholarly historical study, baroque fiction, permutated and cut-up poetry, unsettling memoir, selections from The Process and The Last Museum, and his unproduced screenplay of Burroughs� novel Naked Lunch. In addition, the Reader contains complete texts of several Gysin pieces that are difficult to find, including "Poem of Poems," "The Pipes of Pan," and "A Quick Trip to Alamut." Here, say, or poems you have read over many times. The words have lost meaning and life through years of repetition. Now take the poem and type out selected passages. Fill a page with excerpts. Now cut the page. You have a new poem. As many poems as you like. As many Shakespeare and Rimbaud poems as you like. Tristan Tzara said: "Poetry is for everyone." And Andr� Breton called him a cop and expelled him from the movement. Say it again: "Poetry is for everyone." Poetry is a place and it is free to all cut up Rimbaud and you are in Rimbaud's place. Here is a Rimbaud poem cut up. "Visit of memories. Only your dance and your voice house. On the suburban air improbable desertions . . . all harmonic pine for strife. "The great skies are open. Candor of vapor and tent spitting blood laugh and drunken penance. "Promenade of wine perfume opens slow bottle. "The great skies are open. Supreme bugle burning flesh children to mist." Cut-ups are for everyone. Anybody can make cut-ups. It is experimental in the sense of being something to do. Right here write now. Not something to talk and argue about. Greek philosophers assumed logically that an object twice as heavy as another object would fall twice as fast. It did not occur to them to push the two objects off the table and see how they fall. Shakespeare Rimbaud live in their words. Cut the word lines and you will hear their voices. Cut- ups often come through as code messages with special meaning for the cutter. Table tapping? Perhaps. Certainly an improvement on the usual deplorable performances of contacted poets through a medium. Rimbaud announces himself, to be followed by some excruciatingly bad poetry. Cut Rimbaud's words and you are assured of good poetry at least if not personal appearance. All writing is in fact cut-ups. A collage of words read heard overheard. What else? Use of scissors renders the process explicit and subject to extension and variation. Clear classical prose can be composed entirely of rearranged cut-ups. Cutting and rearranging a page of written words introduces a new dimension into writing enabling the writer to turn images in cinematic variation. Images shift sense under the scissors smell images to sound sight to sound sound to kinesthetic. This is where Rimbaud was going with his color of vowels. And his "systematic derangement of the senses." The place of mescaline hallucination: seeing colors tasting sounds smelling forms. The cut-ups can be applied to other fields than writing. Dr Neumann in his Theory of Games and Economic Behavior introduces the cut-up method of random action into game and military strategy: assume that the worst has happened and act accordingly. If your strategy is at some point determined . . . by random factor your opponent will gain no advantage from knowing your strategy since he cannot predict the move. The cut-up method could be used to advantage in processing scientific data. How many discoveries have been made by accident? We cannot produce accidents to order. The cut-ups could add new dimension to films. Cut gambling scene in with a thousand gambling scenes all times and places. Cut back. Cut streets of the world. Cut and rearrange the word and image in films. There is no reason to accept a second-rate product when you can have the best. And the best is there for all. "Poetry is for everyone . . .